Bubbles are fun to blow and chase and play with. But bubbles can be educational, too. 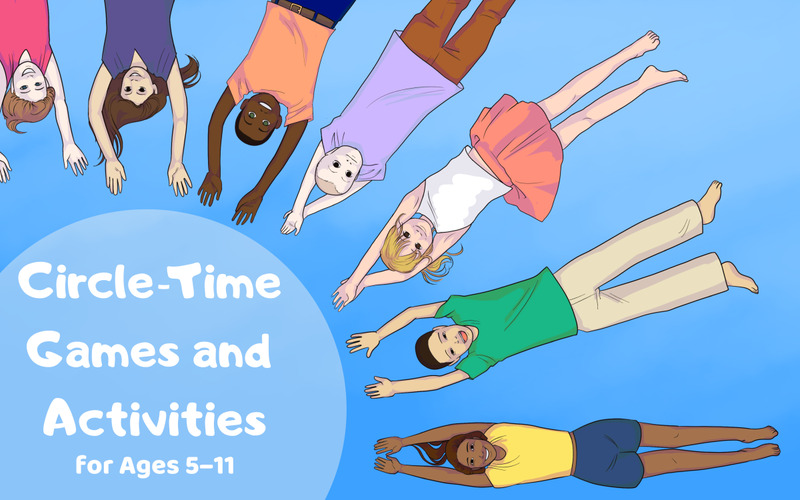 Kids learn about air, surface tension, reflection and refraction, geometry, and much more. Below you will find simple bubble experiments for the little ones and some more challenging bubble projects for older scientists as well. 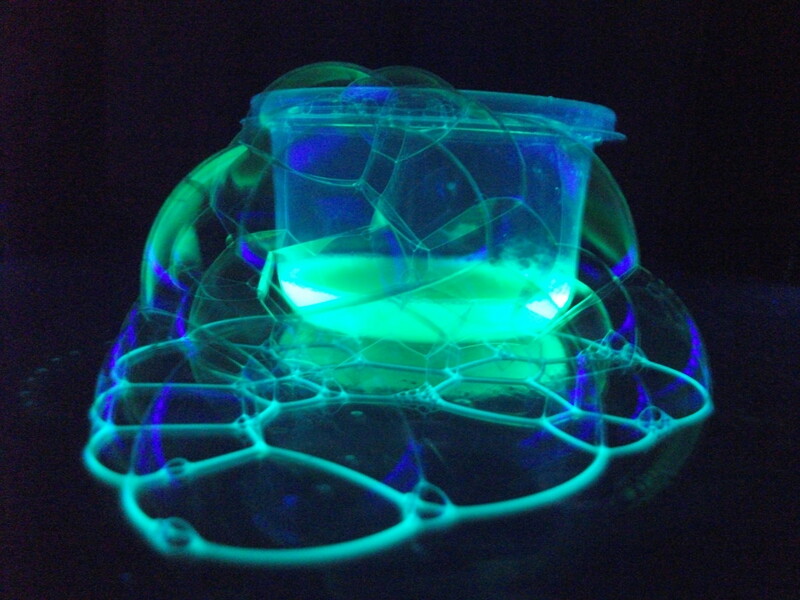 Discover how to make glow in the dark bubbles, how to freeze bubbles, how to create square bubbles, how to light bubbles on fire, and even how to hold bubbles in your hands. 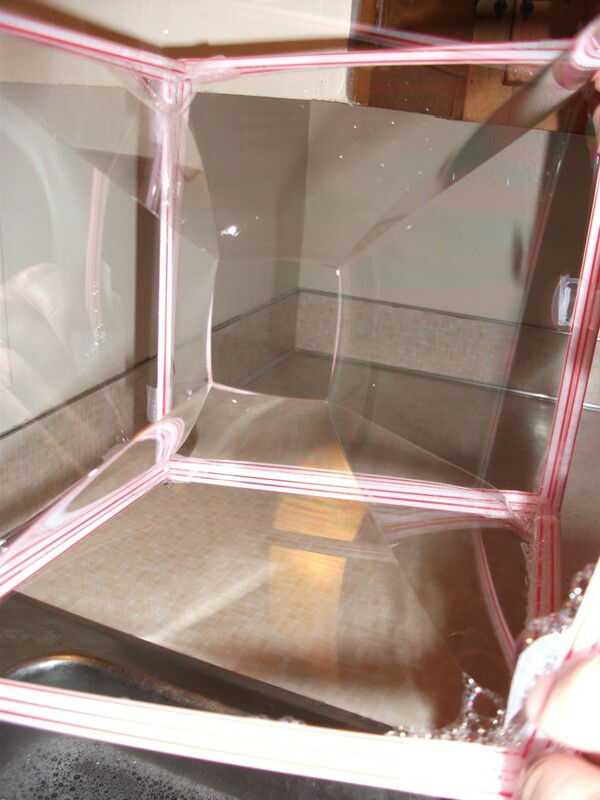 Not only will kids learn with these bubble projects, they will be busy having a great time in the process. This is the place where bubble science meets bubble entertainment. These ingredients are probably in your kitchen right now. Making bubble solution can be a science project in itself. Mixing dish liquid and water is great for blowing normal bubbles, but performing some of these bubble experiments require bubbles that last a bit longer. Here are several recipes for more durable bubbles. Letting the solution sit for a day or so makes for better bubbles. Add the ingredients in a container and mix. Glycerin can typically be found in either the pharmacy section or the crafting section of most stores. It is used in making soaps. Mix all of the ingredients together in a container. Mix the sugar into the warm water until it is dissolved. Then add the dish liquid. Experiment with several bubble recipes. Which recipes work the best? What other types of soap make bubbles? 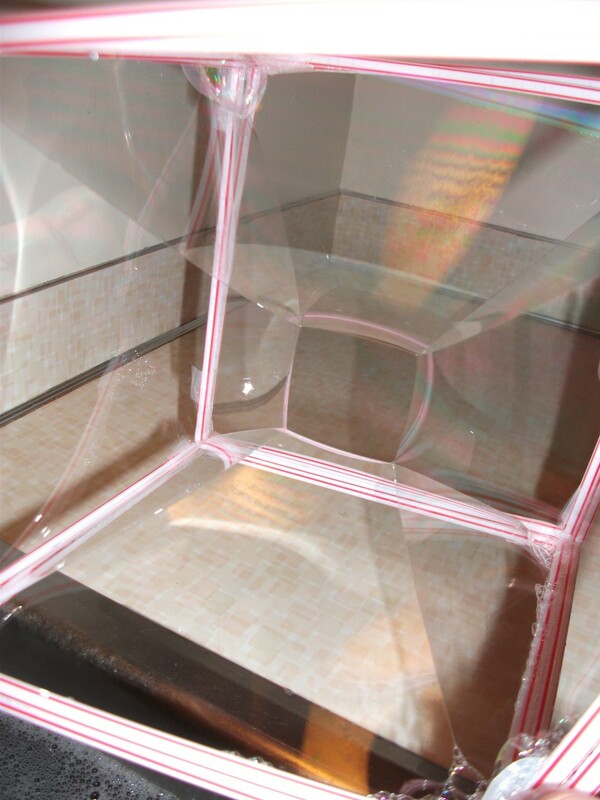 What other ingredients can add stickiness and durability to bubble solutions? 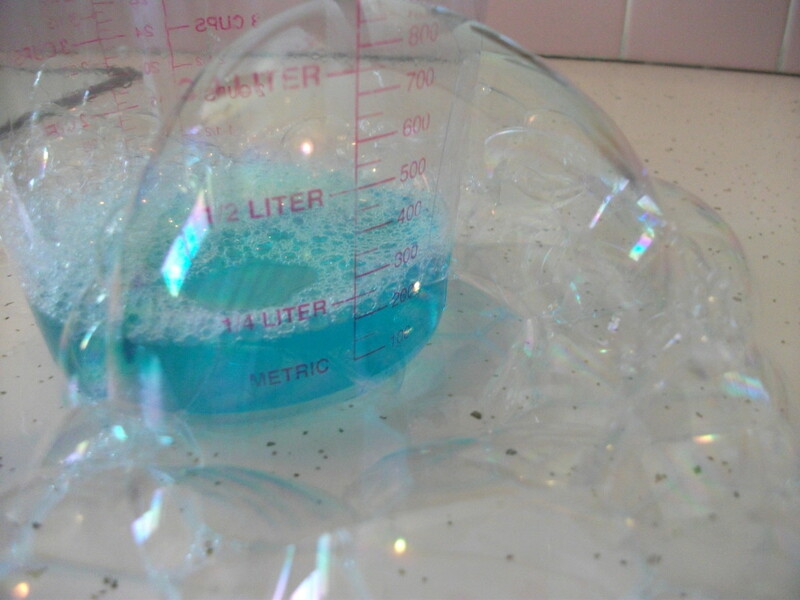 Make brightly colored pink and blue soap bubbles that won't stain clothing or surfaces. What normally happens when you try to touch a bubble? 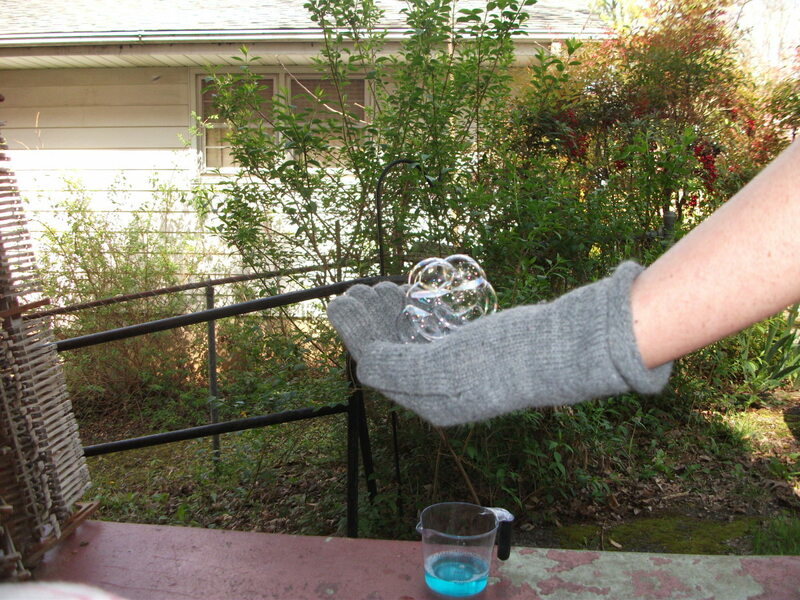 With this experiment, you can hold a bubble in your hand and even bounce it around. To begin, you will need to mix up some bubble solution using either the recipe with corn syrup or the recipe with glycerin from above. For the best results, let the bubble solution sit for about a day. This gives the mixture time to settle for the optimal bounciness. When the solution is good and settled, put on gloves or put a pair of clean socks on your hands. Blow the bubbles or have a friend blow them. 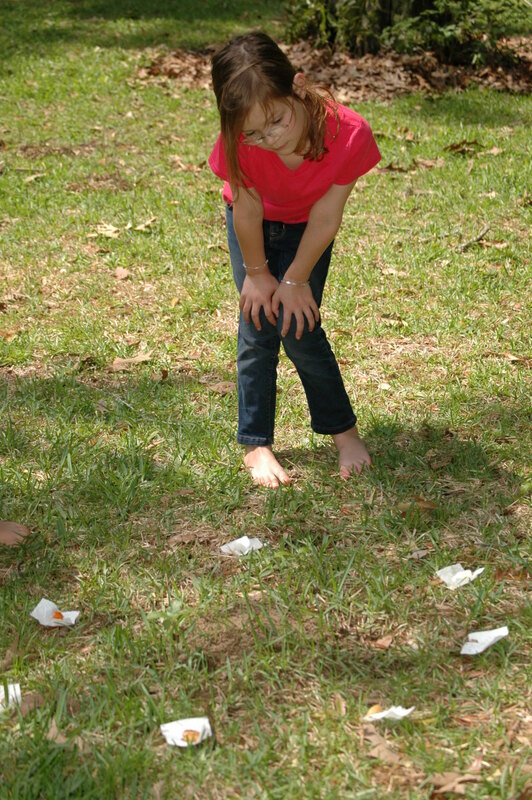 Try to catch the bubbles with your hands. Can you get the bubbles to bounce around now? The gloves are the key to touchable bubbles. Our hands have dirt and oil on them, which causes bubbles to pop. So with the gloves on, the bubbles have a surface that they can land on and even bounce off. Try using other fabrics and surfaces to see which works best. The Bubbles will glow with lights dimmed so you don't have to be in total darkness. Blowing bubbles is usually something to do during the day. But bubbles that glow in the dark make bubble blowing a fun nighttime activity. There is something eerie about glowing bubbles that gives them a mysterious appeal. 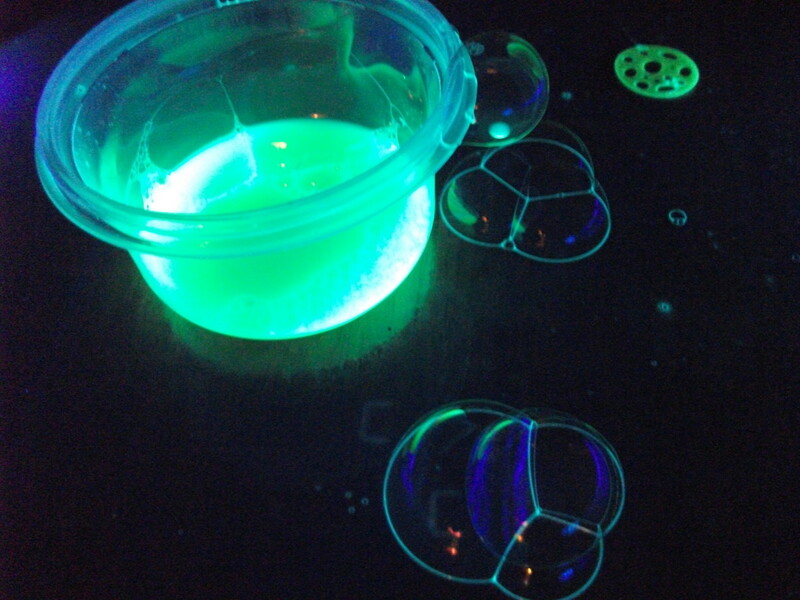 The best way to make glow in the dark bubbles is with a highlighter marker or with a glow stick. (You can use glow powders or paints, but most don't mix as well with the bubble solution). 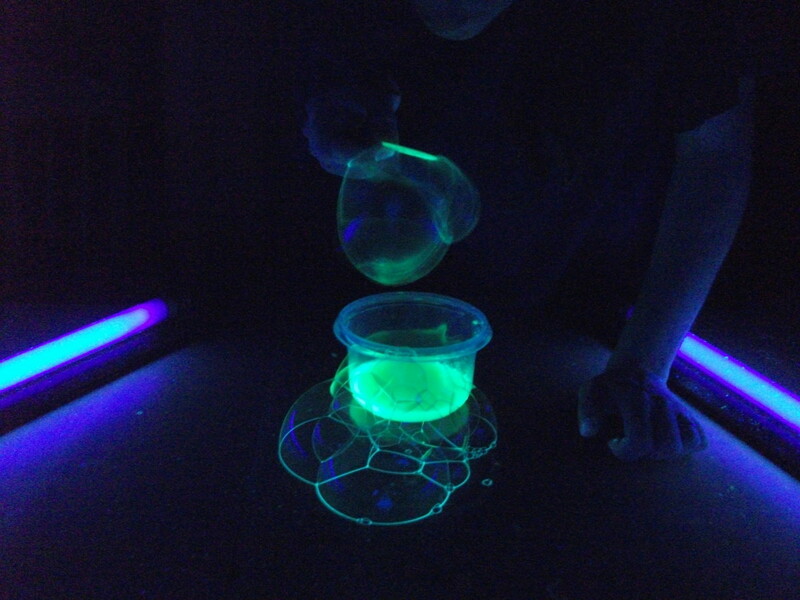 You will have to cut open the marker or glow stick and pour the liquid into a bowl. You may need to soak the felt from the highlighter in a bit of water to get the liquid out. Yellow, green, or orange highlighters glow the best. 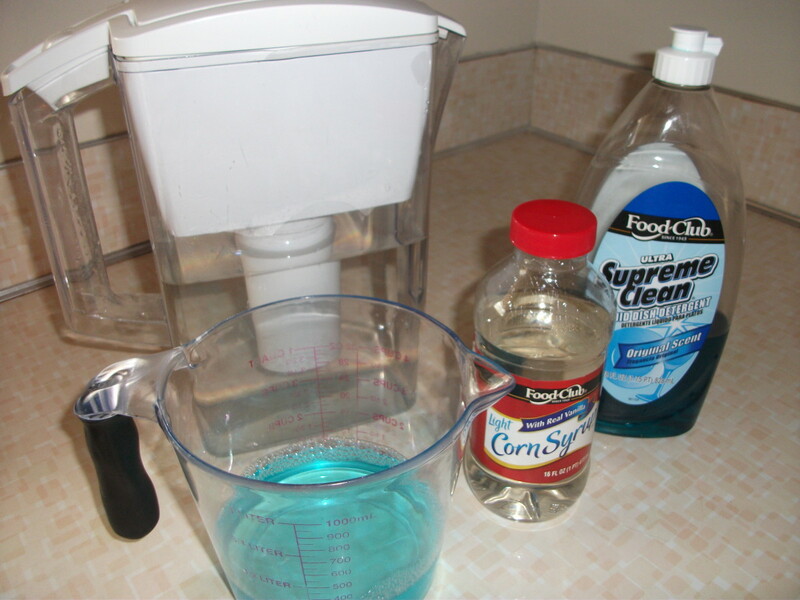 Mix the glowing liquid along with water and dish liquid. Turn off the lights, get a bubble wand, and start blowing glowing bubbles. I like to use tonic water to mix in with the soap instead of regular water. Then I turn on the blacklights for an even better glow (tonic water is blacklight sensitive). If you are using a highlighter, you will need the blacklight to make the mixture fluoresce. Glow sticks, paints, and powders should glow without a blacklight. You may have to expose them to light first. The bubbles should wipe away easily when you are finished. You may want to avoid fabric surfaces just in case. If you are unsure about stains, blow the bubbles outside. If you are using the bubbles with little kids, check the glow materials to be sure they are non-toxic. What shapes do bubbles come in? Bubbles are only round, right? Did you know that you can actually make square bubbles? 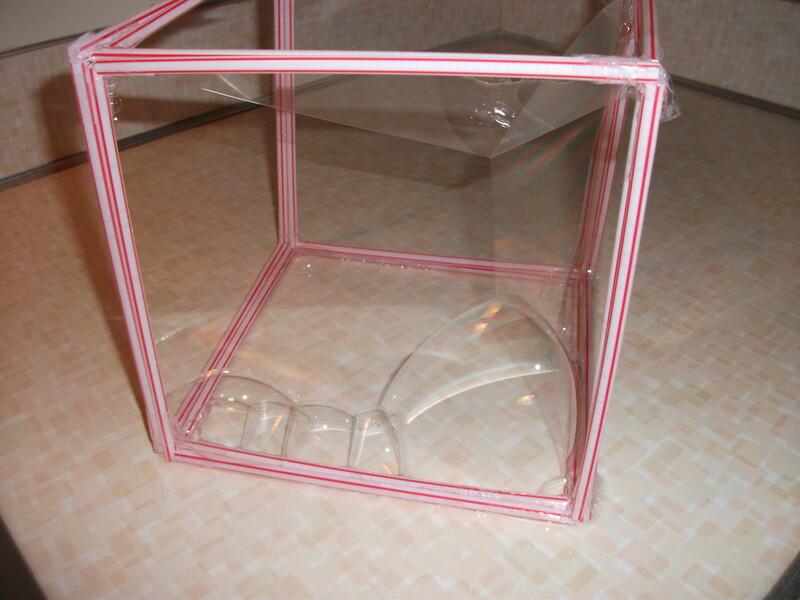 You will need to make a cube to create square bubbles. I used straws taped together. If you have Tinkertoys or other construction toys, you can use those to put together a cube shape. Pipe cleaners will work as well, but they are a bit flimsy. You will submerge the cube, so try to make it small enough to fit into the container you are using. A 5-6 inch cube would be ideal. Get the bubble solution ready (the type of bubbles don't matter for this experiment). Dip the cube into the bubbles. Carefully pull out the cube. Depending on how the bubbles form, you can have a square in the middle or all sorts of other shapes. 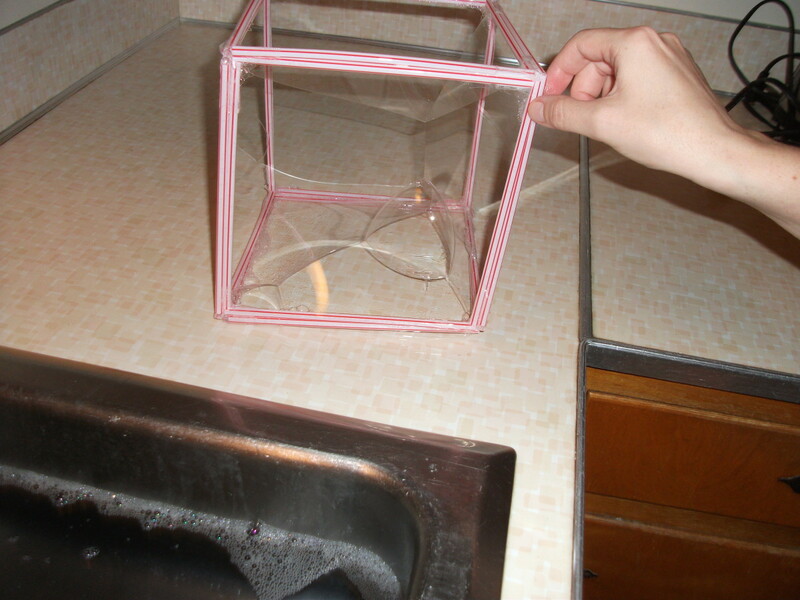 You can dip a wand into the bubbles and then blow it into the cube to change the shape of the bubbles already formed. Experiment with more shapes by making a pyramid to dip into the bubbles. 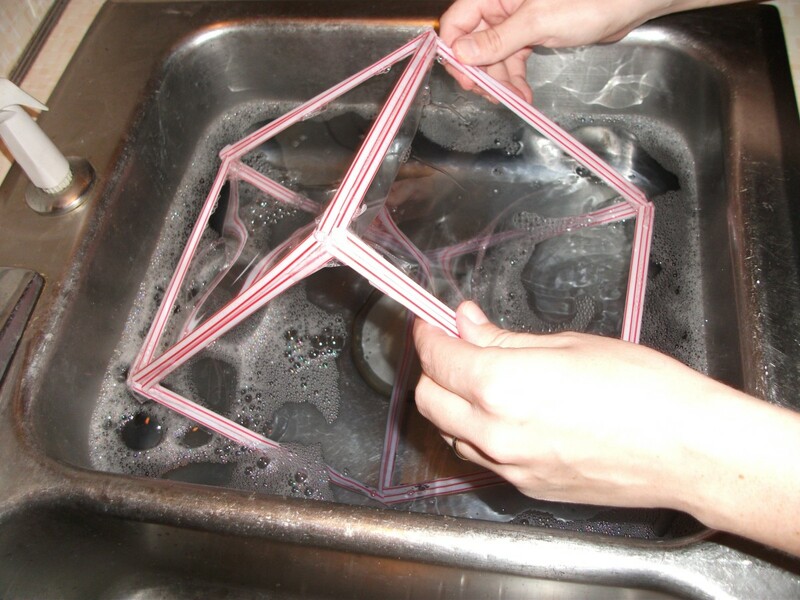 See if you can form triangle-shaped bubbles. Bubbles are made of water, so they can be frozen, too. Frozen bubbles are beautiful to look at and fun to make. But like regular bubbles, they don't last long. Frozen bubbles are tricky to make, but it can be done, even in the summer. The best time to freeze bubbles is outside on a day that is below 32oF. Go outside with some bubble solution and a wand. 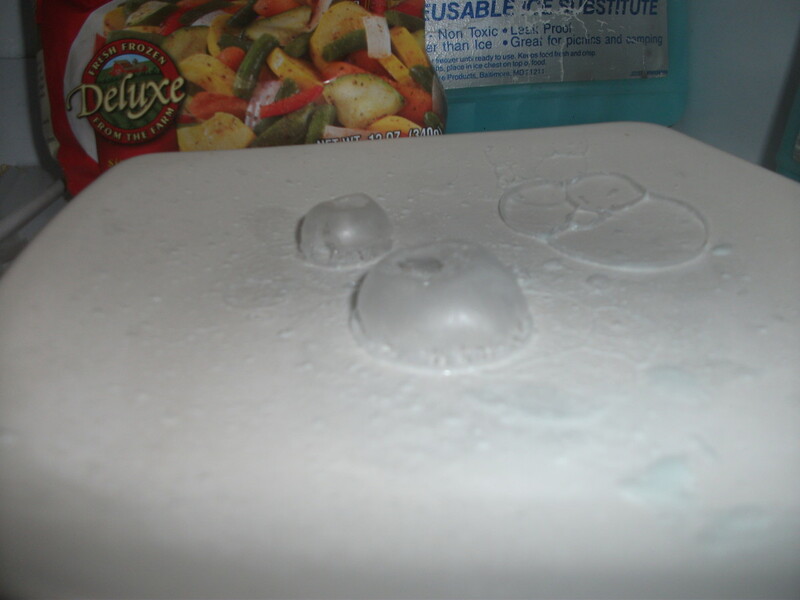 Blow bubbles onto various surfaces and watch as the bubbles begin to freeze. They won't last long, so don't blink. 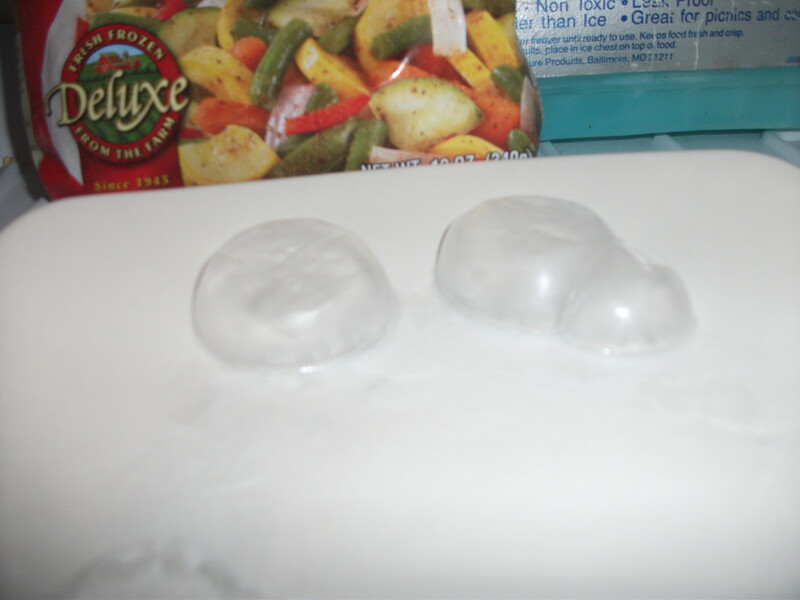 You can also create frozen bubbles in the freezer if you don't want to wait for a below-freezing day. To begin, clear out some space in the freezer near the back. Put a plate in the freezer for about an hour so that it is cold. Mix up some bubble solution. The best kind for this experiment is either the glycerin bubbles or the corn syrup bubbles because the bubbles tend to last longer. Take out the plate and dampen it with water. Then blow bubbles onto the plate. 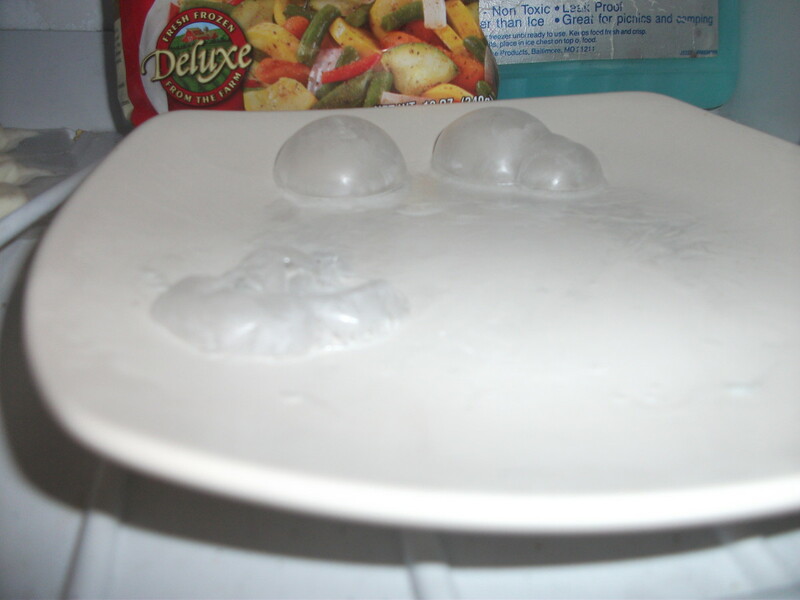 When you have a few bubbles solidly on the plate, very carefully put the plate into the spot you cleared in the freezer. It works best if you do it at a time when the fan in the freezer isn't running. Close the freezer door very slowly. Wait about 10 minutes. If you are going to take pictures, have the camera ready to snap a picture before you open the freezer door. Slowly open the freezer door. The draft will likely pop the bubbles and they will begin to deflate. But you will get a few seconds to look at your frozen bubbles. 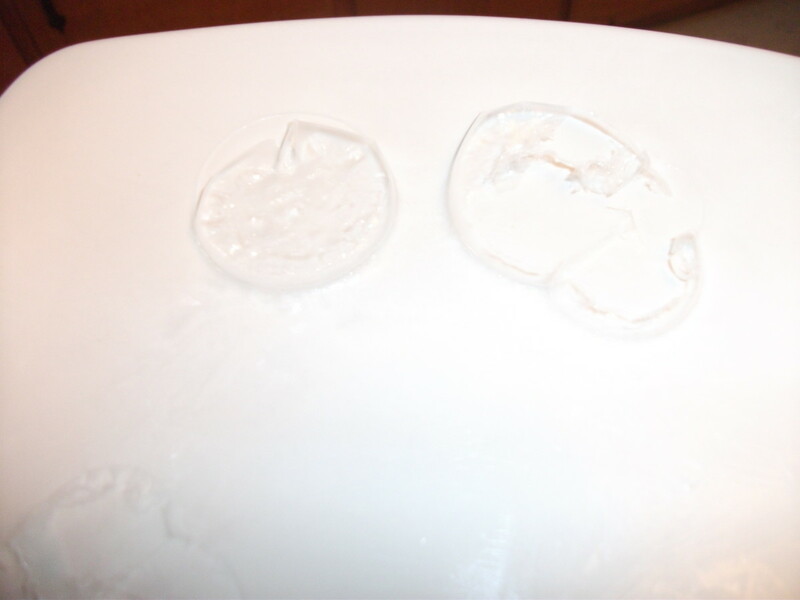 You will see frozen rings on the plate where the bubbles were. **Warning** - Adult Supervision Required - This experiment can be dangerous. You can set bubbles on fire if they are made of a flammable material. To create fiery bubbles, go someplace away from anything that could potentially catch on fire such as curtains, rug, etc. Outside on sidewalk or pavement is best. 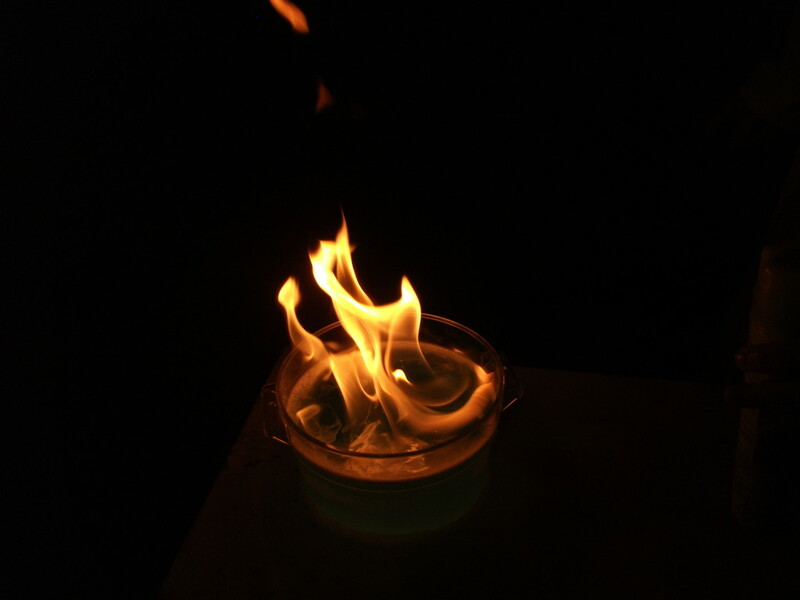 Grass can catch on fire as well, so do the experiment away from grass. If you have long hair, you may want to pull it away from your face to reduce the risk of it catching on fire. 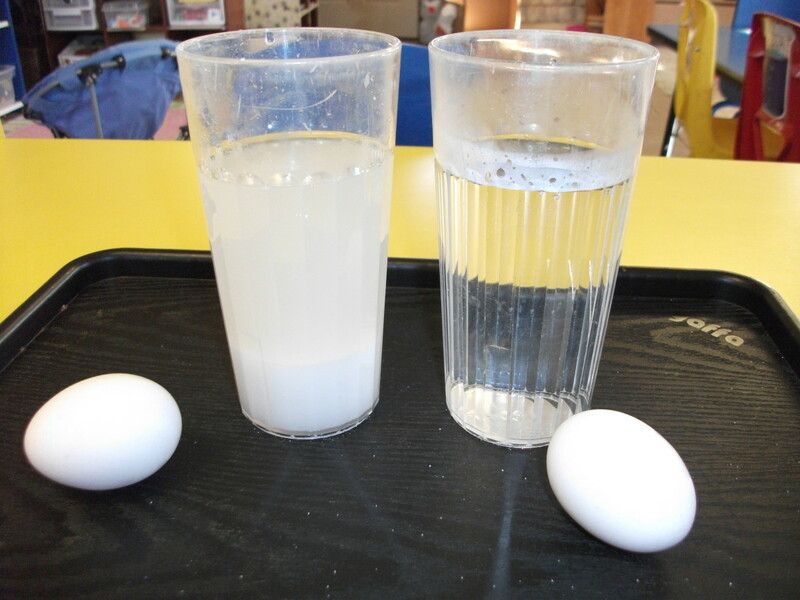 Mix dish liquid and water together in a bowl to make a bubble solution. Make sure to add plenty of dish liquid (at least a couple of tablespoons full). Find an aerosol spray can that has flammable contents. There will be a warning label on the can somewhere. Cleaning products or hairspray is probably the easiest to use for this experiment. Take the spray can and dip it into the bubble mix. Spray the can generously into the mix to create bubbles full of the flammable gas. Move the can away from the mix. Take the lighter and ignite the bubbles. Take a step back and watch as the bubbles flame. The burning should last for a few seconds until anything flammable burns up. If you repeat the experiment, you may have to pour out the mix and freshen it to get the right effect. Cautions: Check the wind direction before you light the fire. Stand upwind of the experiment that way the wind won't blow the fire and smoke onto you. What are you going to do with bubbles? Hold them and pet them. Bend them out of shape. I'm a mad scientist. I will run all of the experiments on my bubbles! Make giant bubbles by filling a wading pool with bubble solution. Use a hula hoop instead of a bubble wand. You can add food coloring to make the bubble solution pretty colors. Some food coloring will stain, so do a test before blowing the bubbles. This works best outdoors. Use pipe cleaners to make bubble wands. Shape the pipe cleaners into squares, triangles, hearts, and more. When you blow the bubble, what shape comes out? Do experiments to see what kind of weather is best for bubble blowing. Bubbles pop when they come in contact with dirt, oil, or anything that is dry. For example, which would be better, a windy day or a calm day? Or a humid day or a dry day? 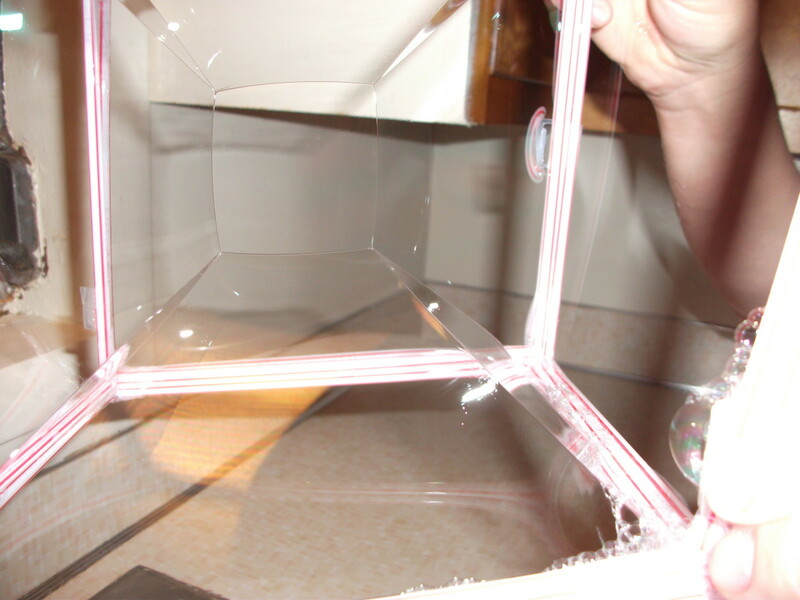 Build a bubble blowing machine. Check out Zoom and FamilyFun to get started. Create scented bubbles by adding essential oils into the bubble solution. You will need to use unscented dish liquid so that its smell won't overpower the oils. Make soda bottles bubble over and erupt. Create bubbling and fizzing science projects all with stuff that is probably in your kitchen right now. 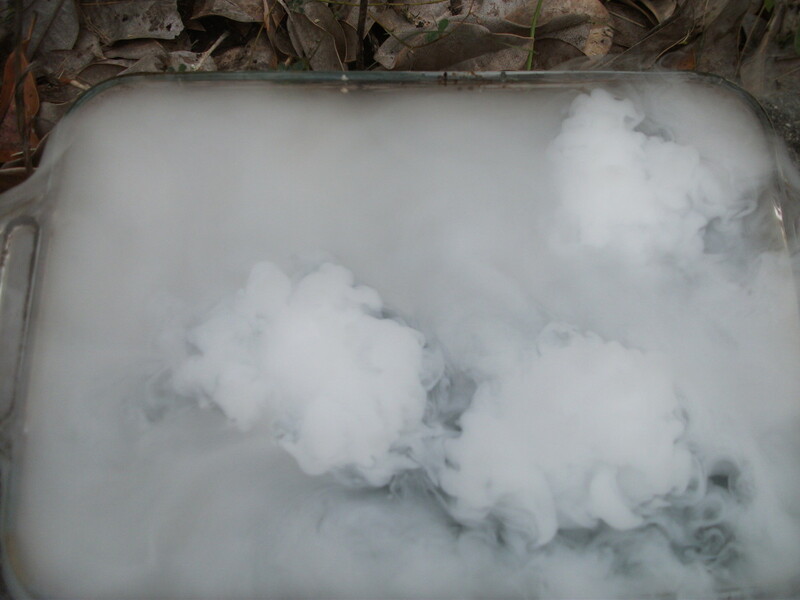 Dry ice can be a fun substance to use in experiments. 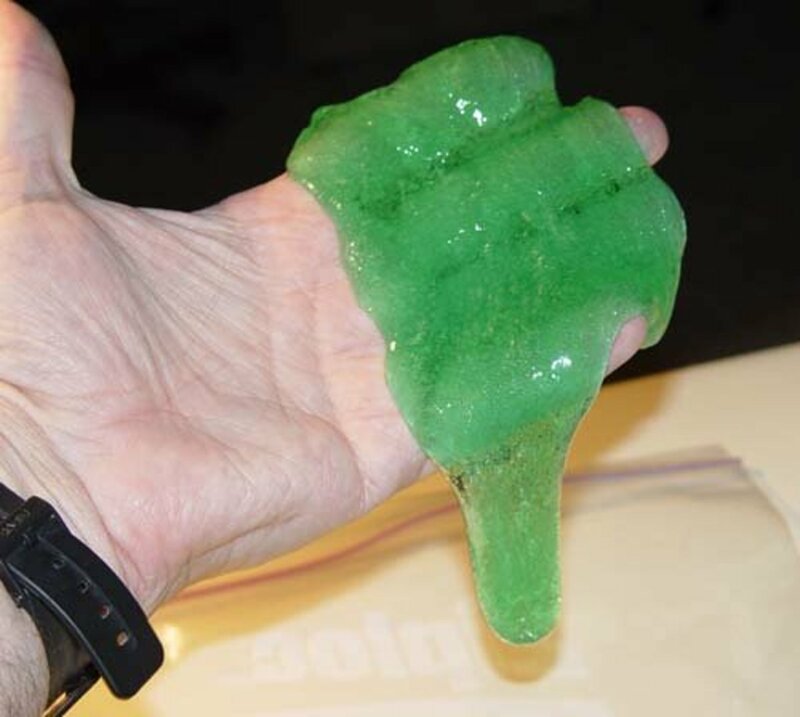 It has cool properties that cause it to fog and make bubbles when placed in water and other liquids. 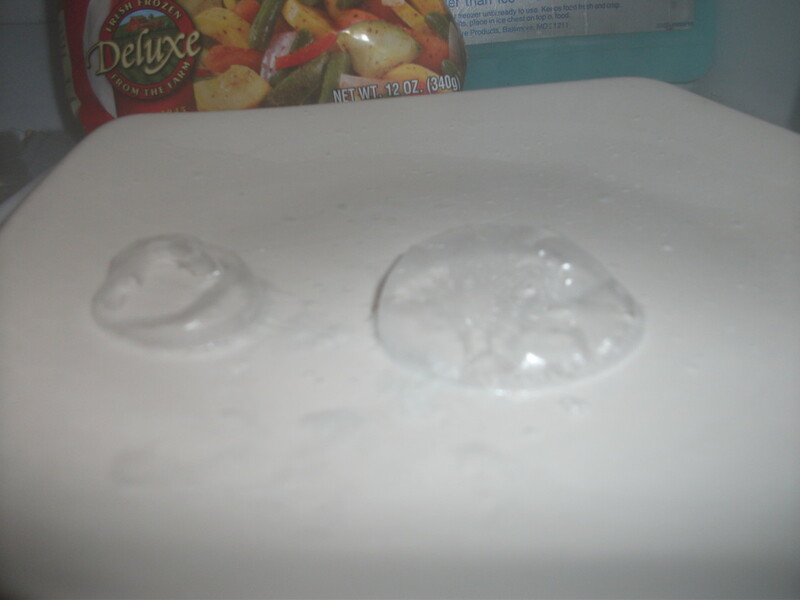 Make foggy bubbles you can touch and much more with these dry ice activities. The bubbles are very attractive. These experiments are also so wonderful that I will give a wonderful time for my School Experiment. Thanks for sharing, and congrats on the HOTD award. The square bubbles are very attractive. These experiments are also so wonderful that I will give a wonderful time for my kids. Thanks for sharing this simple and cute hub. Brilliant! My kids love bubbles, will definitely be trying out these experiments in the holidays. Thank you! This is awesome, I love bubbles! 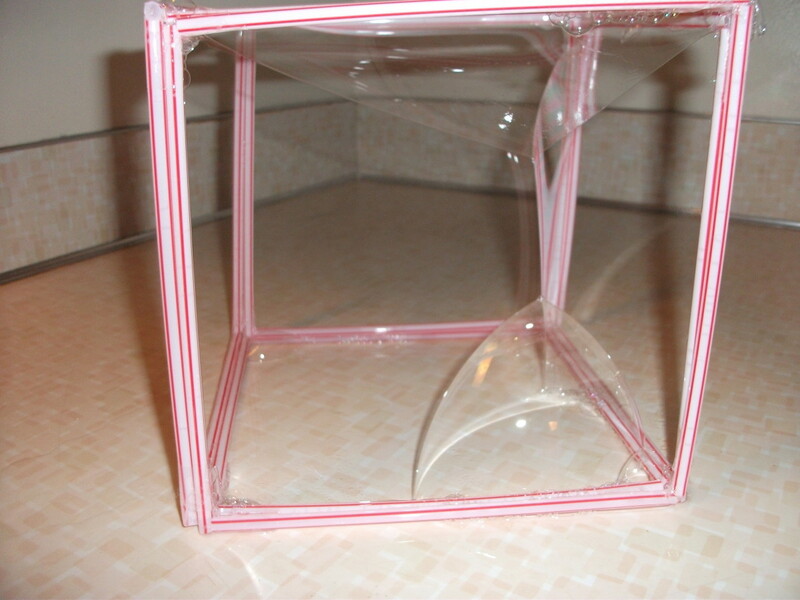 I like the square bubble making but I have a science project coming up and I want something really good! sadie423 - Hope your boys enjoy! Thanks! Very cool! Love the glow in the dark bubbles, I know my boys would too. PatienceAllana - Thanks! Hope your kids have a blast. Great hub, looking forward to trying some of the recipes with my kids. Movie Master - Thanks! I love the glowing bubbles, too. ComfortB - Thank you! Bubbles are made of water, so they can freeze. But most people just think of them during warm weather. HawaiiHeart - Hope your kids love them. Thanks! kelleyward - Thank you! I'll have to check out your hub. RTalloni - Prime bubble season is almost here! Thanks so much! jpcmc - Thanks for the compliment. I made some of the videos myself, so getting feedback is really appreciated. Natashalh - I haven't done a test for the best bubble soap yet, but I'll bet Joy is still one of the top picks. I bet you had lots of fun memories of the giant bubbles. Thanks! DeviousOne - Thank you very much! wayseeker - Wow! Thanks for the praise. I spent a lot of time on it. Glad to know it paid off. Thanks again. Heather Says - They are some of the most unusual ones. Thanks! The frozen and glowing bubbles are my favorites! great hub! Great hub! Congrats on the hub of the day! Holy cow this looks like fun! Voted up, useful, and awesome! I will definitely be returning here this summer for some experiment time with my kids. This is great information, well presented, with lots of interactive videos--what a great package you have put together here. This is definitely a worthy hub-of-the-day winner! Congratulations. Fine work. Glow in the dark bubbles? That is awesome! I used to make giant bubbles with my grandmother using one of those special wands. We always found Joy soap worked best. This was 20 years ago, so I don't know if it is still true today. Such wonderful ideas. They're explained clearly and the videos are great. Congratulations on the hub of the day. What fun this will be to come back to again and again--thanks! Congrats on a great summertime Hub of the Day award! Cant wait to try this with my kiddos soon! I just published a hub on free things to do with kids I'll add your link to it now! Congrats on HOTD! This is great! I'm voting up, forwarding to my niece and nephew, and pinning. Thanks for another great Hub! Super cool! I'll have to try these expirements with my kids. Really interesting. Never occurred to me that one can freeze bubble. daaa! Anyway, thanks for sharing, and congrats on the HOTD award. What a fabulous hub, congratulations on hub of the day! 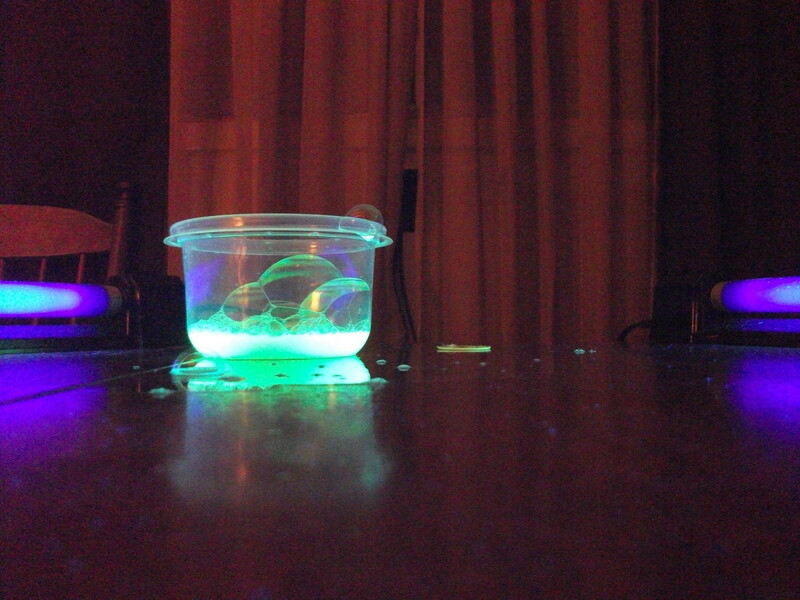 Great, exciting experiments, especially the glow in the dark bubbles! ekstrom002 - Thanks! Learning can be disguised as fun. nishlaverz - The corn syrup really helps make long-lasting bubbles. Thank you! Archana G Saha - Thanks! mary615 - A dog who loves bubbles. That is cute. I'll have to blow some bubbles for my dog. Hope everyone enjoys. Thank you! markbennis - Thanks so much! Glowing bubbles are my favorite, too. vespawoolf - Thanks! Hope your nieces and nephews (and you) have fun. Ardie - Hope your bubble party is fun. You can still be in the mad scientist club even though you didn't get to vote for it. Thanks so much! leahlefler - Bubbles can definitely make a fun playdate. Most kids can blow bubbles for hours, especially if they are glowing. Thanks for sharing! DoctorDarts - Thank you very much! TnTgoodrich - The burning bubbles is a cool trick, but the glowing bubbles are more fun to play with. Hope your kids are impressed. Thanks! POWERS1205 - This is a great alternative to tv. It can keep them entertained for a long time and it is something that can play with by themselves once you get them started (except for the fire bubbles). Thank you! That is really cool! Thank you so much. We have 5 children at home and sometimes we run out of ideas on things to do around the house. We don't like plugging them into the tv, so projects like this give us some good alternatives. Absolutely fantastic!! Definitely going to try the strong bubbles! 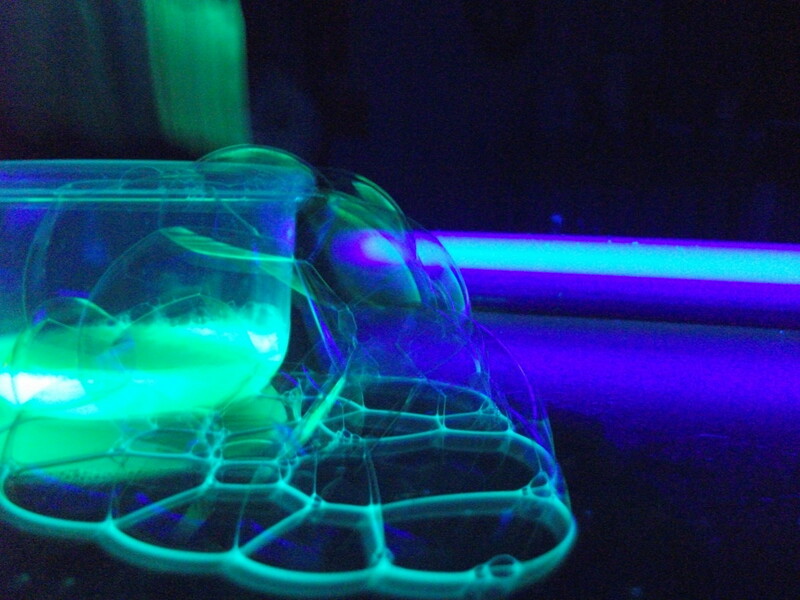 My boys would LOVE these experiments - particularly the glow-in-the-dark bubbles! I'm sharing this with some of my mom friends, because I foresee a fun summer playdate party with bubble activities! This is a cool hub...I had no idea so much could be done with bubbles! I've marked this so I can try an experiment or two with my nephews and nieces next time we're together. Thank you and congratulations on a well-deserved Hub of the Day! Great ideas for bubbles especially like the glow in the dark bubbles, great tips and voted up! Wow! What a wonderful Hub! I can see why it got HOTD. Congrats! So many great ideas for me to do with my Grands and my dog. Yes, my dog, Baby, loves to chase bubbles the kids blow. I just don't know which of your methods we'll try first. Delightful Hub. I voted it UP, etc.etc. Thanks for these great ideas. My daughter loves bubbles but I can never seem to get the mix right when I do it myself. Will try out your recipes. This was interesting and informative. Learned some new things about bubbles I probably wouldn't have otherwise thought to ever look into. Nice work! Simone - Researching was the perfect excuse to try all of these myself and it was AWESOME! Thank you! Robin - I hope the frozen bubbles work for you. They are definitely cool! Have fun in the snow! Who doesn't love bubbles?? I am going to bring bubbles when we head up to the snow to see if we can create frozen bubbles. What a great idea. We will definitely be making our own bubbles soon. BURNING BUBBLES? Glow in the DARK bubbles??? OMG THIS IS ALL SO COOL!! I absolutely love this Hub. And need to find an excuse to do one of these experiments stat! Marcy Goodfleisch - Thanks so much! Learning should always be fun. There are tons of great tips and ideas for kids nowadays. I wish I had (or my mom had) known some of this stuff when I was younger. kayyluh - Experiments in high school can be really fun. Thank you! 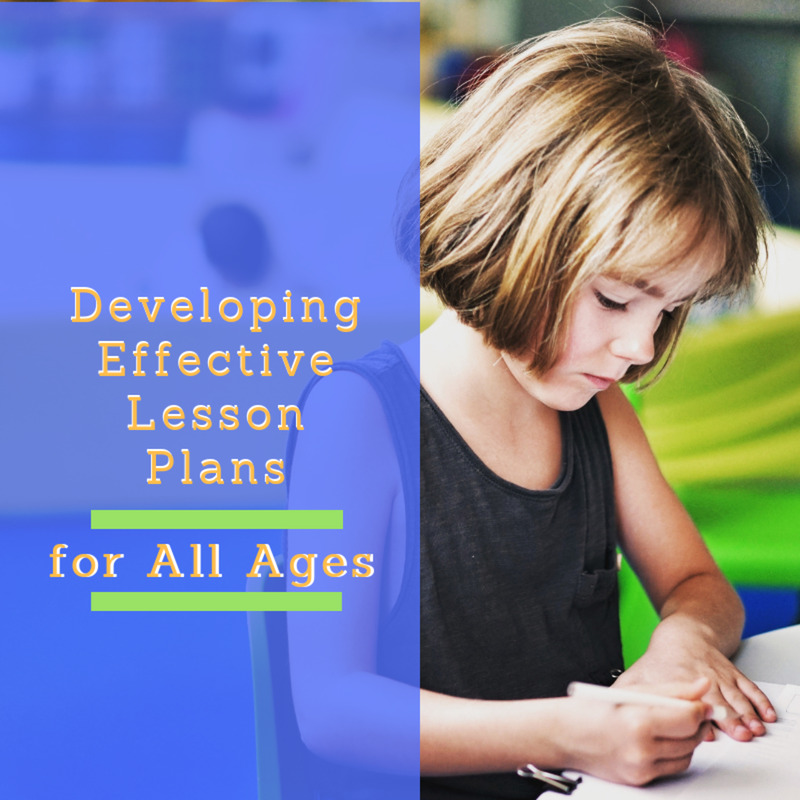 This is a great resource for parents and teachers! Thanks! This is an amazing hub! Wish I'd had access to this when my kids were little (except maybe for the flammable versions). Kids will not only learn, but have fun with this. I will share this with some friends who work with various age groups. Great hub for kids. They just love bubbles! How much fun did you have! Fantastically interesting and entertaining hub. Love the pictures. I chuckled all the way through. I have teenage boys. It looks like a good project. Maybe it will distract them from the refrigerator. This is a great idea! 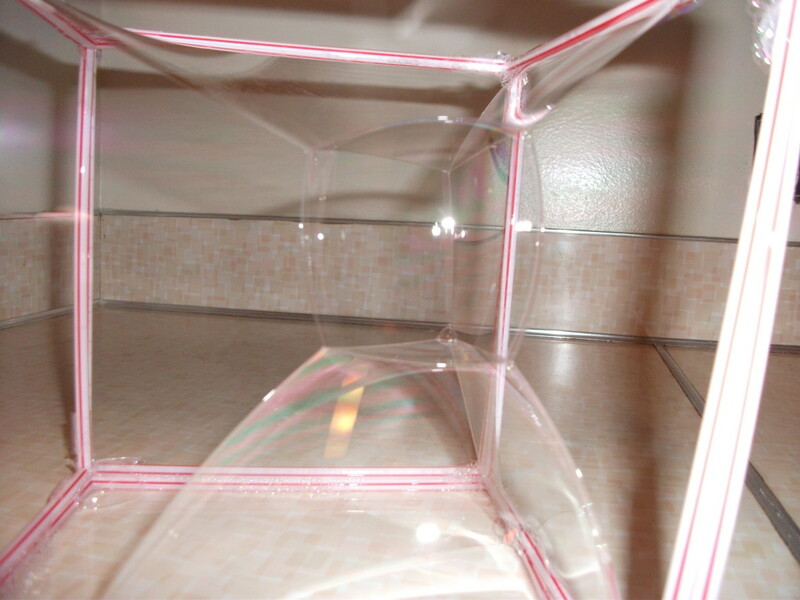 Kids would love these bubbles experiments! Great job! ANd I thought a bubble was just a bubble! You must have had a blast researching this hub! Great hub, you have thoroughly explored the many varied aspects of the humble bubble and it really inspires the reader to try some new things. I will roll up my sleeves and have a go over school break with the kids. Thanks for the super ideas! 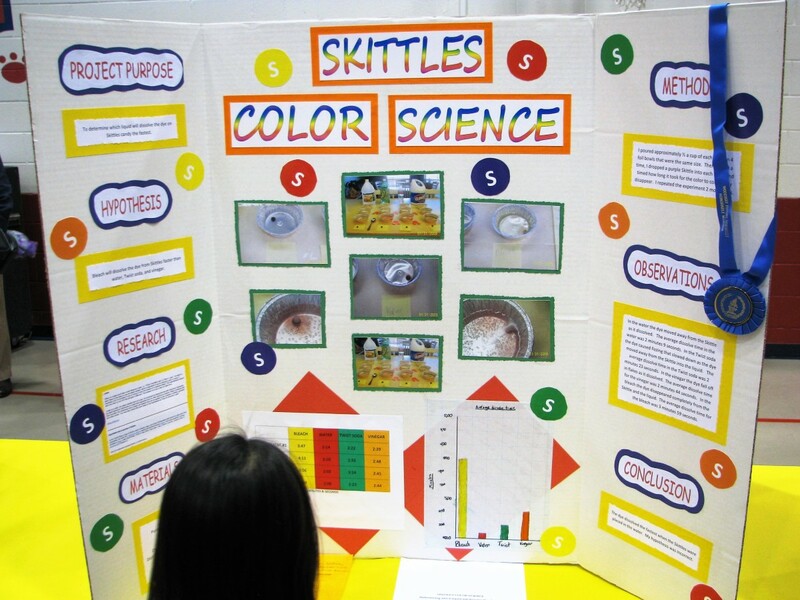 This looks like great fun for a homeschool science experiment, thanks for sharing! Voted up & useful. I have 3 boys and I'm not sure whose going to have more fun with these experiments...them or me? This is honestly one of the funnest, most interesting, well written hubs I've read since being here. Voted way up and other good things! This was awesome! 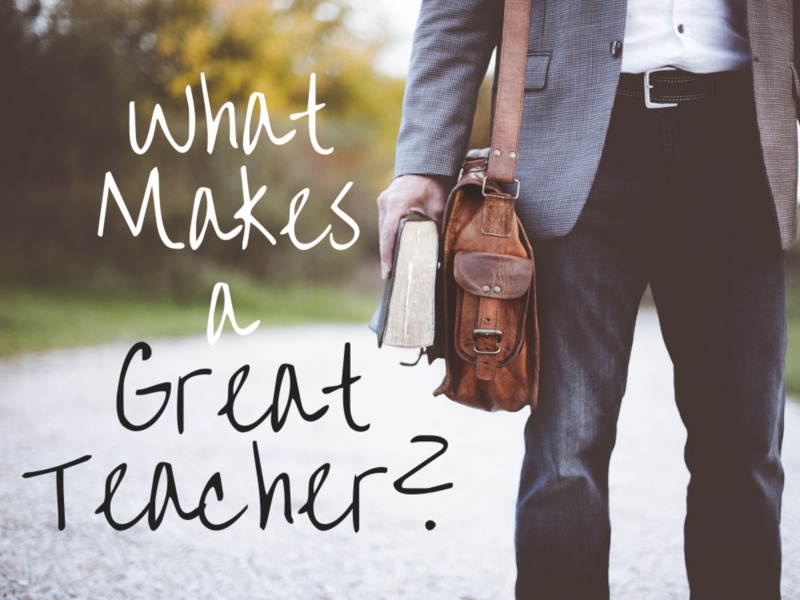 I am a teacher and I am definitely going to need to find a way to incorporate this lesson into my weekly plans. Thank you! prekcarolyn - The square bubbles are very fun to play with (even for adults, ha ha). Kids will love them. Thanks! alliemacb - Bubbles seem simple, but they can teach us a lot. Thanks so much! WD Curry 111 - Maybe we can build a time machine so you can do lessons with bubbles. Or you could just play with bubbles by yourself now. Where were you when I was a substitute teacher? This is a really interesting hub. Who knew there was so much to bubbles? Voted up and awesome! Very cool! Thanks for sharing. I especially loved the last video of the square bubbles! I'm going to have to do that in my classroom!